What follows starts out from a car park, an almost empty psychiatric hospital car park at that! Why should you be interested? Well if words are not to be wasted then perhaps the mention of the huge frame of Stephen Fry, polymath and mind extraordinary, alone in this car park, bent double and close to vomiting out his soul, will broker your curiosity? I hate to simplify matters that are obviously complex. Scientists seek certainty and to establish facts; poets on the other hand may accept the uncertainties of life in a wider quest for meaning. My job as a medical doctor, so dear to me, reveals daily that there is more to care than algorithm, evidence base, or simplified categories of disorder. In the same breath I understand the need, never to be ousted, of pragmatism. So in your reading of what follows please accept my humble, loftless, but sincere belief that medicine must not drop its handshake with humanities. Stephen Fry’s disappearance will carry this argument. This narrative shall be divided into three sections; each considering Stephen Fry and Cell Mates from a different perspective. Each section has been entitled after a different name that Simon Gray gave his play. It is interesting that Gray changed his mind three times on the title, but in each reconsideration he unknowingly carried the summary point that I would wish to make from Fry’s disappearance. “That’s what we do when something hooks us from the daily bore. We become interested, then obsessed. Possibly a bit screwy. Never in a month of Sundays did I imagine that the car park of my old psychiatric hospital, Clerkseat in Aberdeen, would feature in a BBC documentary! Yet it did so on a Tuesday night in mid-September 2006. Stephen Fry, in the two part documentary – The Secret Life of the Manic Depressive – that he had put together with his ex-Wimpole Street GP, allowed the camera to witness him in a moment of prostrate weakness. He was pallid beyond granite cold, and his giant frame bent-double looked as if it were going to puke. Fry unable to speak! A condition surely antithesis to the loquaciousness that we are so drawn to. So that is the moment – the unedited moment that so hooked me. It drew me closer to Stephen Fry and his choice not to make such pain disappear from archive. “One could imagine each moment as having a door into it, a door out. Perhaps you did not see Fry’s documentary, or possibly you did see it but do not recall this moment as I did. Nevertheless are you most curious to know what rendered Stephen Fry both apoplectic and wordless? Was it the diagnosis? Was it an insight previously not open to the dimensionless Fry? Or was it something else? It is my belief that it was the last and my consideration here is based on having trained with the doctor whose consulting room Fry had just left. Professor Ian C. Reid although perhaps not the polymath equivalent of Fry, is actually one of the brightest doctors of his generation, and in my opinion one of the best in a generational crop of researchers in the biology of mental health. It strikes me as being curious, that for a scientist who has publicly revealed distrust of ‘narrative’ considerations of emotion, Professor Reid has a way with words, and bonhomie that is matched by few; Professor Reid can separate nurture from nature with such style that has the clapping cheers of today. I must say that the nurture-nature debate presents an historical dichotomy that I do not follow. “The things we try to make fit, even when they don’t. At a meeting in Princes Street in Edinburgh in October 2010, Professor Reid took part in a debate on antidepressant medication and choose to open with the very moment, captured as a screen-shot, of Stephen Fry in the Clerkseat car park. Professor Reid then explained that Fry had just left his consulting room after being told he was suffering from a specific diagnosis. No further comment was made by Professor Reid, but this screen-shot seemed to challenge what was covered in the documentary. Much has been written about biological reductionism which I believe can be at the expense of good research the likes of which Professor Reid in his career has pursued. I naturally agree with Leon Eisenberg that the very success of biomedicine has exacted a price in the way it has narrowed the physician’s focus exclusively to the biology of disease. However, the remedy does not lie in abandoning reductionism (where it is appropriate) but in incorporating it within a larger social framework. In examining Fry’s disappearance such reductionism will not be my focus. The following chapters will explore Fry’s life and disorder. Four chapters now follow, each taking a different perspective on Fry and his disappearance. The first chapter ‘Says He Says He!’ is narrated in Stephen Fry’s own words. It will touch upon identity, stigma, and our human need for simplified explanations. The second chapter ‘Homesick’ considers an historical perspective through Johnathon Oldbuck, Walter Scott’s Antiquary. The third chapter ‘Says He Says I’ is punctuated by the words of Simon Gray, not because I share his view of Fry (for I do not) but because in his book Fat Chance, which is no longer in print, he reveals in a stream of angry consciousness, just how much of thinking is normally hidden. 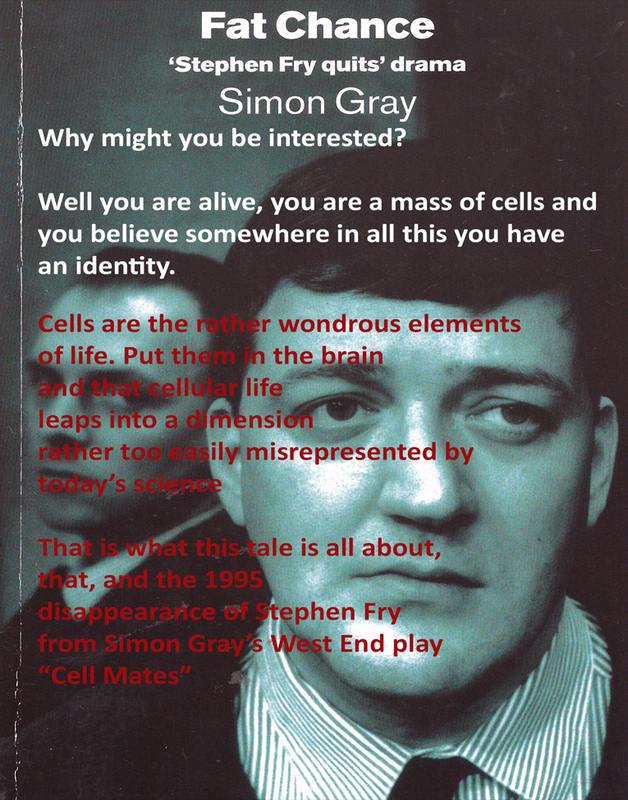 Ironically Gray’s account of the Cell Mates production and Stephen Fry’s betrayal, as he saw it, is far more readable than the play itself! The conclusion to my ‘Cell Mates’ is an argued plea for such cells to work together: science and humanities; identity and diagnosis; pragmatism and complexity. It will compare the meeting of Stephen Fry and Professor Reid in 2006 with that of C.P. Snow and F.R. Leavis in the ‘two culture’ debate of 1959. It will end by asking for wisdoms, wisdoms that have diverged, to be mates and not to linger separately. Here one appreciates every better moment brought by technology, but asks for a new enlightenment between our cells. 1. First Cell: Says He Says He! Quotations are from Cell Mates. What follows here is Fry’s disappearance from Cell Mates in his own words. I shall not try to get to the bottom of Stephen Fry. Many have tried. Most have failed. “Don’t try to analyse him,” his sister once warned “It annoys him.” So what will follow is Stephen Fry in his own words. There has always been the implication that the Cell Mates ‘thing’ was because Fry hated failure and that the reviews were not good. “I do hate facing failure,” he once said, “but it wasn’t that. You know when I said the computer saved me? It did, really. I love computers. They have revolutionised my life.” However there is more to this story than salvage by technology – of that there can be no doubt. So what happened on that third morning of the West End Production of Cell Mates? Well, in a later chapter I will relate the rather bilious and unforgiving account as given by the now deceased playwright and producer Simon Gray. Though he was a man drawn into feuds, Simon Gray revealed, through his final and arguably best work, The Smoking Diaries, his weaknesses with extraordinary honesty. Fry, in a similar consideration, found a nation’s embrace, not for his glorious self, but for revealing so openly, dramatically, and always apologetically, his weaknesses. In this sense, Fry and Gray were cell mates, rather than Blake and Bourke of the original play. Their strengths revealed through their separate weaknesses. This cellular oxymoron gets us no closer to the facts of that first Sunday in February 1995 when Fry left a message on his answer-phone: ‘I’m sorry. I’m so very sorry.” Fry then thirty-seven years old was starring with another popular British comic, Rik Mayall, in Simon Gray’s West End production. In Cell Mates, Fry had the role of George Blake, a spy and traitor who was sprung from Wormwood Scrubs, where he was serving a forty-two-year sentence, by a prison friend, Sean Bourke. Fry fulfilled his ‘Peter and the Wolf’ obligation at midday, returned to his apartment, wrote a series of letters to his acquaintances, and then went into the garage to kill himself. “My finger was on the ignition key,” he said. Fry’s disappearance was the subject of scandal and concern across the British Isles, where it dominated the headlines. A substitute was found for Cell Mates, but the production never recovered, and it closed prematurely three weeks later, with a loss of some three hundred thousand pounds. “I have been horrified and embarrassed to see from the papers how much attention my departure has provoked. I do want to apologise for all the distress and concern I have caused. “I have been in touch with those closest to me to assure them of my good health, but I cannot let this opportunity go by without apologising again to two of the kindest and wisest people I know, Simon Gray and Rik Mayall, who have borne the brunt of this dismal affair. I have dealt them a very low blow indeed. My other friends know who they are and that I will be in touch with them. “I can only offer cowardice, embarrassment and distress as excuses for such absurd behaviour. I would like also to say that I hold no grudge against the theatre critics. “I left not out of pique, because I had been wounded or hurt, but because I was afraid that they were terribly right and that I was letting down Rik Mayall’s brilliant performance in Simon Gray’s remarkable play. After realising how inadequate my performance in Cell Mates was, I’m afraid I suffered a dreadful attack of what golfers call the yips and actors call stage fright and I slunk away rather than cause a scene in public. “Basically, I couldn’t stand the heat, so I escaped from the kitchen. The fact that I did so – the inadequacy of my acting side – perhaps show that I am not cut out for the business I have been engaged in for the last 15 years. “But the reviews and sense of failure were, I think, only the straw that broke this camel’s back. For years now I have been incapable of saying ‘no’ and have allowed my work to become my life. “I am offering this to the press in the hope that they will accept that I am not a Lord Lucan or a Reggie Perrin. This statement had the effect of making Fry a martyr. The comedian was adored by the British public, who now extended him their sympathy. Whatever your view of Fry as a celebrity, one has to conclude from his own writings that he is indeed a character not to be reduced in understanding; he is, simply complex. It is in this sense that, we cannot separate him from his childhood, his shaping, his influences and his ‘journey’. Fry’s apologies, carried in nearly every utterance, may be endearing but do reveal a tortured ‘self.’ He has repeated many times that “he should be someone else but wasn’t,” we know of his discomfort of his body, and the giant frame he sees only as awkward and without grace; whereas we, the adoring public see a corduroy, Roald Dahl sized, story-telling, and most comforting uncle. “Brilliant yet destructive. I get bored very easily with myself. Time and again with Stephen Fry, one consideration sits at odds with another. I am not sure what that may tell, if indeed anything, but take for example, Fry’s belief that he “thought relationships were for other people, but not for me”. Yet, as we all know, with his love of his computer, Fry has the widest relationship – virtually – on the planet though twitter. What do we know? Well we know that Stephen Fry continually ran away from school and stole credit cards; indeed he was expelled from three schools. He has also recorded that his father and family doctor put him in a psychiatric ward, where he was diagnosed as a manic depressive; a diagnosis he once asserted that he “hated for its inaccuracy”. Stephen Fry’s tutor at Cambridge said he was a “show-off”, but didn’t know whether this was through conceit or insecurity. So what is the truth; and does the truth lie more with Simon Gray the playwright or Stephen Fry the actor? Can a play based upon a real-life narrative – George Blake’s betrayal of Sean Bourke, the man who helped him escape Wormwood Scrubs – be revisited? And can truth be so bizarre that an actor playing a betrayer turns a fictional narrative into reality? Where in such a colourful admixture of reality and production, actor and person, biology and lifestyle, order and disorder, can the truth lie? You will have to wait till the penultimate chapter ‘Says He Says I’ to hear the take of Simon Gray the playwright. I suggest that you anticipate no imprisoned thoughts! Gray’s cell had absolutely no bars. This chapter examines Stephen Fry’s identity and illness. This is no easy task as considerations beyond the cell have neither membrane nor wall to contain them. For the broad picture on human nature, steering clear of religion, there are few better writers than Walter Scott. In his 1816 novel The Antiquary, we have a most under-rated and misunderstood work; a work in which human nature is explored in a way that is delightfully nuanced. In the world of 2011 the Antiquary makes observations not out of time, so do not be put off, and if anything his commentary serves to remind us all that in treating illness we must not take too narrow a view of the sciences – this being particularly so when it comes to matters of the mind. Oldbuck, the Antiquary, described how investigation and examination of the past could provide the ground for understanding the present. He revealed this in a narrative not of his own, but in third person. Furthermore the story he embodied dramatised the slow and uncertain detection and authentification of various buried pasts and buried treasures. Here then is the third explicit question: can we dismiss our shaping from the understanding of our present? Considering this for Stephen Fry: might his shaping and his past have had any bearing upon his disappearance? Here, as for us all, we must consider childhood, schooling, identity, sexuality, traumas, stressors, and a list beyond any simple summary, but not, as the Antiquary would argue, beyond narrative. Also here we should consider the supports to life; such as relationships, mentors, drugs, alcohol . . . another long list on life’s journey. Of course there are no easy answers but might the science of the mind take a further step forward, if it followed the Antiquary’s argument, that science must look over its shoulder to our shared past? “To me, Stephen had become a kind of ogre. Simon Gray’s Fat Chance may be the finest expression of controlled anger that you will read, for Gray regarded Stephen Fry’s disappearance as an act of betrayal. “The facts of the matter are precisely what Stephen Fry has publicly stated them to be. He left the production of Cell Mates in the most cowardly fashion because he believed he was incapable of performing the part of George Blake properly. Stylistically Fat Chance is different to Gray’s diaries, for here his anger is cold and deliberate, assassinating Fry for both narcissism and pretence. It is certainly worth asking why Simon Gray could only regard Stephen Fry’s disappearance from stage as an act of betrayal (the subject of the play apart). Gray’s father has been described as an aloof pathologist who cheated when playing chess with his son and was openly unfaithful to his wife. Apart from the pathologist father prepared to con his son, the childhood waywardness of Gray is not dissimilar to Fry. So are they Cell Mates, or is there still doubt? Gray in his Smoking Diaries, waivers delightfully through memories revisited several times, and so a kind of autobiography emerges. He tells us that he and his older brother were taken to Montreal at the beginning of World War II when they were 3 and 4 years old, where they were left with their grandparents by their mother, who one day said she was going out for some milk and never came back. It is certain then that long before Stephen Fry disappeared, Gray needed to make a commentary about betrayal and the most personal cost that this brings. This echoes the central theme of Cell Mates itself. It was ultimately Stephen Fry’s identity that Gray attacked. Here, I think I understand why Stephen Fry disappeared. I would suggest that such extreme rhetoric can have the effect of undermining the importance of the issue being debated. I am of the most certain view that science and humanities should not linger in separate cells, but work together as mates. So why should you care about any of this? The screw-ball archivist Oswald Bates asked just such a question in Poliakoff’s masterpiece ‘Shooting the Past.’ For Oswald, the impending destruction of his library of historic photographs in the name of corporate ‘progress’ was unbearable. To try and save his library he secreted the most valuable photographs randomly within a million images. Only Oswald knew where they were! No computer could help. The true worth of the archive was revealed by Oswald in a story of meaning rather than materialism. Cell Mates matters because we are all cells, yet somewhere in these cells we carry our identity. It seems to me that identity has the ‘appearance of disappearance’, being often marginalised in scientific study. In understanding identity one needs narrative. Science must not lose sight of this. What was it that terrified Stephen Fry in the car park? Only Fry will know. Was it the diagnosis given to him by Professor Reid? Or was it that any narrow diagnosis challenged Fry’s sense of identity based on his greater understanding of his life, and the potential for that diagnosis to redefine him in the eyes of his audience. Very sadly Professor Ian Reid died at the age of 53 in June 2014. I was fortunate to train in Aberdeen alongside Ian.